Grunty Fen stands – or rather, tilts – on a patch of relatively firm ground in an otherwise soggy landscape. 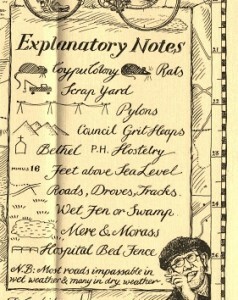 The nature of the environment can be quickly gleaned from a glance at the Explanatory Notes to the Tourist Map of Grunty Fen (right). Grunty Fen’s neighbouring villages include Gloat, Little Harm, Rat Dyke, Dank, Drench, Windy Huts, Bitter End, Down Market, Upper and Lower Nacker and the recently established trading community at Bottle Bank. 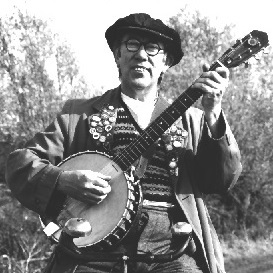 Dennis of Grunty Fen is a wily, banjo-playing, cycle-riding fenman who lives with his 92-year-old Gran in a converted Edwardian railway carriage – The LNER – in Grunty Fen. Every Sunday the erudite, urbane but ultimately hapless Mr South would doggedly interview Dennis on the wireless, and two worlds collided. Dennis thought Mr South was a stuck-up snob. Mr South thought Dennis was a dim clod. 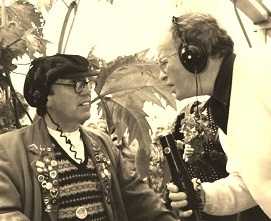 Nothing ever shifted either of them from his view of the other, and for seventeen years this abrasive relationship formed the basis of the radio show Dennis of Grunty Fen. Filling Dennis’s stories and fuelling Mr South’s disbelief and despair appeared an ever-growing cast of misfits and oddities, such as The Feral Nuns, roaming the fens on Vespas, the only people ever to strike terror into the hearts of sturdy fen folk; Woollie Woollard, sloping-house owner and mudmog breeder; George Robinson, a Nissen-hut-dwelling Ukrainian shepherd refugee from WWII; Oily Olly, the fat-slopping chip-van man and many, many more. 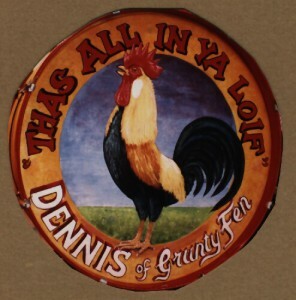 Although Dennis’s creator – musician Pete Sayers – died in 2005, Dennis lives on, together with Pete’s musical achievements, as his memorial. So welcome to Dennis and his squalid, poverty-stricken but essentially lovable world.